The UK Department of Health Alert (EFA/2013/004) issued on 19th November 2013, has highlighted an issue that we recommend all organisations with cold water storage tanks (CWST) pay attention to. 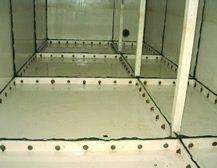 It has been found that the internal supports in cold water tanks can hold stagnant water that can allow biofilm and slime growth which can harbour micro-organisms such as Legionella and Pseudomonas. Our experience shows that many cold water tanks do indeed have internal supports for cross-bracing and lid support. Some of these are hollow and when breached will allow water to flow into these hollow areas resulting in stagnant water coming into contract with the stored water. The Department of Health have issued an alert with an action for all NHS Estates and Facilities teams to inspect all water tanks for hollow supporting pipes and where found to replace with solid alternatives. This issue is not manufacturer specific, so you are advised to contact your water management company to investigate any remedial actions that may need to be taken. Although this alert is mandatory for the UK Health sector, HBE would recommend that this remedial action is taken by all clients as this problem is likely to be widespread.